Fish populations are highly dependent upon the characteristics of their aquatic habitat which supports all their biological functions. Migratory fish require different environments for the main phases of their life cycle which are reproduction, production of juveniles, growth and sexual maturation. The life cycle of diadromous species takes place partly in fresh water and partly in sea water: the reproduction of anadromous species takes place in freshwater, whereas catadromous species migrate to the sea for breeding purposes and back to freshwater for trophic purposes. The migration of potamodromous species, whose entire life cycle is completed within the inland waters of a river system, must also be considered. The construction of a dam on a river can block or delay upstream fish migration and thus contribute to the decline and even the extinction of species that depend on longitudinal movements along the stream continuum during certain phases of their life cycle. Mortality resulting from fish passage through hydraulic turbines or over spillways during their downstream migration can be significant. Experience gained shows that problems associated with downstream migration can also be a major factor affecting anadromous or catadromous fish stocks. Habitat loss or alteration, discharge modifications, changes in water quality and temperature, increased predation pressure as well as delays in migration caused by dams are significant issues. The upstream passage for anadromous and potamodromous species past obstacles can be provided for through several types of fishways: pool-type fish passes, Denil fish passes, nature-like bypass channels, fish lifts or locks, collection and transportation facilities. Only few special designs have been developed in Europe, Japan, New Zealand and Australia for catadromous species, namely for eels. The critical point in upstream fish passage design is the location of the fish pass entrance and the attraction flow, which must take into account river discharge during the migration period and the behaviour of the target species in relation to the flow pattern at the base of the dam. Some sites may require several entrances and fish passes. The downstream migration problems have not been as well studied or fully considered as those associated with upstream migration. The accepted downstream passage technologies to exclude fish from turbines are physical screens, angled bar racks and louvers associated with surface bypasses. Behavioural guidance devices (attraction or repulsion by lights, sound, electricity) have not been proven to perform successfully under a wide range of conditions and are still considered as experimental. A non-exhaustive review of the current status of the use of fish facilities at dams throughout the world is presented, with the main target species considered from North America, Western Europe, Eastern Europe, Latin America, Africa, Australia, New Zealand, Japan and Asia. 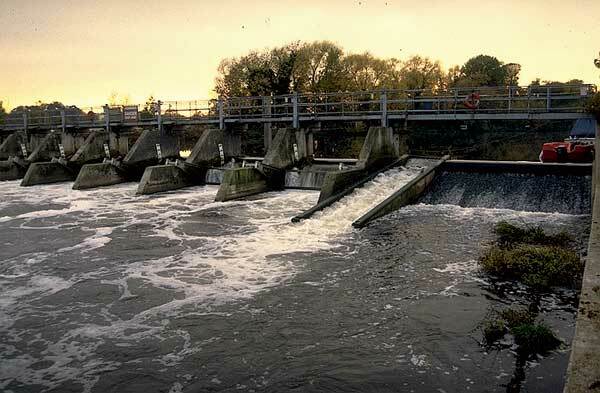 The most frequent causes of fish pass failure include lack of attraction flow, unsuitable location of the entrance, inadequate maintenance, hydraulic conditions (flow patterns, velocities, turbulence and aeration levels) in the fish pass not adapted to the target species. Upstream passage technologies can be considered well-developed only for a few anadromous species including salmonids (e.g. Atlantic and Pacific salmon, sea-run trout) and clupeids (e.g. American and Allis shad, alewives, blueback herring) in North America and Europe. There is an urgent need for better biological information (e.g. migration period, swimming capacity, migratory behaviour) and to do fish passage research (upstream and downstream) for other native species. 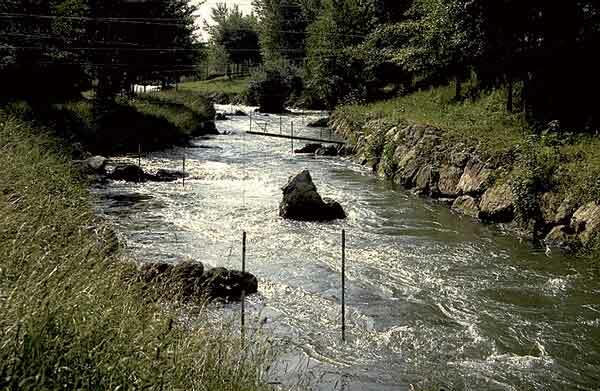 Effectiveness of a fish pass is a qualitative concept which consists in checking that the pass is capable of letting all target species through within the range of environmental conditions observed during the migration period. Effectiveness may be measured through inspections and checks: visual inspection, trapping, video checks. The efficiency of a fish pass is a more quantitative description of its performance. It may be defined as the proportion of stock present at the dam which then enters and successfully moves through the fish pass in what is considered an acceptable length of time. The methods giving an insight into the efficiency of a pass are more complicated than those for effectiveness. Marking and telemetry are valuable techniques to assess the overall efficiency of fish passes and the cumulative effect of various dams along a migration path. The targeted effectiveness for a given site must be defined with respect to the biological objectives sought. It is therefore related to the species considered, the number of obstacles on the river and the position of the obstacle on the migration route. The fact that almost nothing is known about migrating species, particularly in developing countries, must not be a pretext to do nothing at a dam. In the absence of good knowledge on the species, the fish passes must be designed to be as versatile as possible and open to modifications. 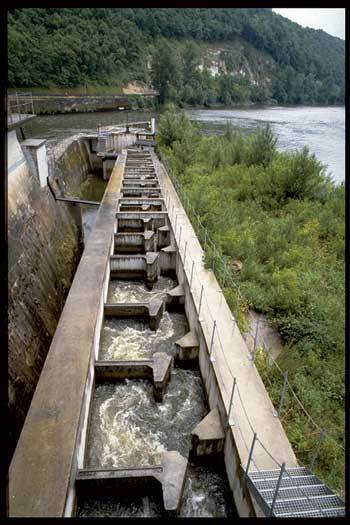 Some fish passes are more suitable than others when targeting a variety of migratory species, such as vertical slot passes with successive pools. Devices to monitor fish passage must be installed. This monitoring process will enable the fish pass to be assessed and the feedback thus obtained may be useful for other fish pass projects in the same regional context. For high dams, when there are numerous species of poorly-known variable swimming abilities, migratory behaviour and population size, it is best to initially concentrate mitigation efforts on the lower part of the fish pass, i.e. to construct and optimize the fish collection system including the entrance, the complementary attraction flow and a holding pool which can be used to capture fish to subsequently transport them upstream, at least in an initial stage. Fish pass design involves a multidisciplinary approach. Engineers, biologists and managers must work closely together. Fish passage facilities must be systematically evaluated. It should be remembered that the fish pass technique is empirical in the original meaning of the term, i.e. based on feedback from experience. The most significant progress in fish passage technology has been made in countries which systematically assessed the effectiveness of the passes and in which there was a duty to provide monitoring results. One must never lose sight of the limits to the effectiveness of fish passes. In addition to problems relating to fish passage at obstacles, there are indirect effects of dams which may prove of major significance such as changes in flow, water quality, the increase in predation and drastic changes to the habitat upstream or downstream. The protection of migratory species for a given dam must be studied in a much wider context than the strict respect of fish passage alone. Fish populations are highly dependent upon the characteristics of the aquatic habitat which supports all their biological functions. This dependence is most marked in migratory fish which require different environments for the main phases of their life cycle which are reproduction, production of juveniles, growth and sexual maturation. The species has to move from one environment to another in order to survive. It has become customary to classify fishes according to their capacity to cope during certain stages of their life cycle with waters of differing salinities (McDowall, 1988). The entire life cycle of the potamodromous species occurs within fresh waters of a river system (Northcote, 1998). The reproduction and feeding zones may be separated by distances that may vary from a few metres to hundreds of kilometres. The life cycle of the diadromous species takes place partly in fresh and partly in marine waters, with distances of up to several thousands of kilometres between the reproduction zones and the feeding zones. Anadromous species (e.g. salmon), whose reproduction takes place in freshwater with the growing phase in the sea. Migration back to freshwater is for the purpose of breeding. Catadromous species (e.g. eel) have the reverse life cycle. Migration to the sea serves the purpose of breeding and migration back to freshwater is a colonisation for trophic purpose. Catadromy is much less common than anadromy. Anadromous species recognize their native river catchment and return there, with a low rate of error, to reproduce. This phenomenon of returning to their river of birth ("homing") depends principally on olfactory recognition of streams. Consequently, each river basin has a stock of its own which is a unique unit. Amphidromous (e.g. striped mullet) species spend parts of their life cycle in both fresh and marine waters. Their migration is not for the purpose of breeding but is typically associated with the search for food and/or refuge. There are about 8 000 species of fish which live in freshwater and a further 12 000 which live in the sea; and there are about 120 species which move regularly between the two (Cohen, 1970). The building of a dam generally has a major impact on fish populations: migrations and other fish movements can be stopped or delayed, the quality, quantity and accessibility of their habitat, which plays an important role in population sustainability, can be affected. Fish can suffer major damage during their transit through hydraulic turbines or over spillways. Changes in discharge regime or water quality can also have indirect effects upon fish species. Increased upstream and downstream predation on migratory fish is also linked to dams, fish being delayed and concentrated due to the presence of the dam and the habitat becoming more favourable to certain predatory species. One of the major effects of the construction of a dam on fish populations is the decline of anadromous species. The dam prevents migration between feeding and breeding zones. The effect can become severe, leading to the extinction of species, where no spawning grounds are present in the river or its tributary downstream of the dam. Since the nineteenth century, there has been a continuous and increasing decline in stocks of diadromous species in France: in a large majority of cases, the main causes of decline have been the construction of dams preventing free upstream migration. The negative effects of these obstructions on anadromous species (particularly Atlantic salmon and Allis shad) have been much more significant than water pollution, overfishing and habitat destruction in the main rivers. Obstructions have been the reason for the extinction of entire stocks (salmon in the Rhine, Seine and Garonne rivers) or for the confinement of certain species to a very restricted part of the river basin (salmon in the Loire, shad in the Garonne or Rhône, etc.) (Porcher and Travade, 1992). Sturgeon stocks have been particularly threatened by hydroelectric dams on the Volga, Don and Caucasian rivers (Petts, 1988 ). 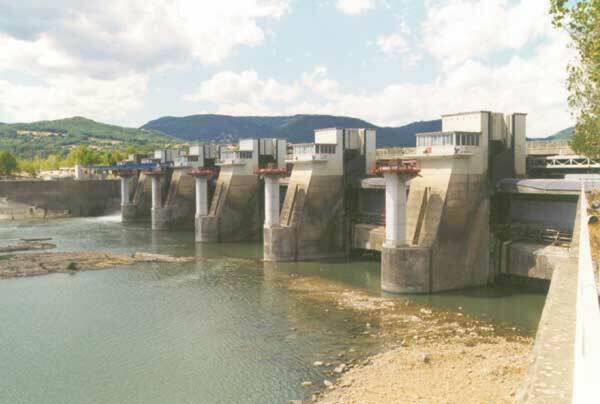 On the East Coast of the USA, the building of dams has been identified as the main reason for the extinction or the depletion of migrating species such as salmon and shad on the Connecticut, Merrimack and Penobscott rivers (Baum, 1994; Meyers, 1994; Stolte, 1994). Zhong and Power (1996) reported that the number of fish species decreased from 107 to 83 because the migration was interrupted by the Xinanjiang dam (China). The reduction of biodiversity occurred not only in the flooded section but also in the river below the dam. Quiros (1989) mentions that dam construction in the upper reaches of Latin American rivers appears to lead to the disappearance of potamodromous species stocks in reservoirs and in the river upstream of the structure. The same occurs in reaches where a whole series of dams and reservoirs have been constructed. 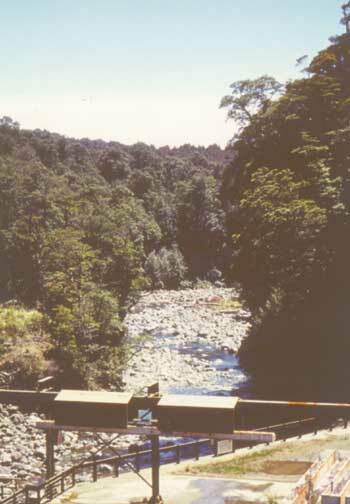 In Australia, obstructed fish passage has led to many instances of declining populations or extinctions of species in the affected basin (Barry, 1990; Mallen-Cooper and Harris, 1990). The concept of obstruction to migration is often associated with the height of the dam. However, even low weirs can constitute a major obstruction to upstream migration. Whether an obstacle can be passed or not depends on the hydraulic conditions over and at the foot of the obstacle (velocity, depth of the water, aeration, turbulence, etc.) in relation to the swimming and leaping capacities of the species concerned. The swimming and leaping capacities depend on the species, the size of the individuals, their physiological condition and water quality factors as water temperature and dissolved oxygen. Certain catadromous species have a special ability to clear obstacles during their upstream migration: in addition to speed of swimming, the young eels are able to climb through brush, or over grassy slopes, provided they are kept thoroughly wet; some species (i.e. gobies) possess a sucker and enlarged fins with which they can cling to the substrate and climb around the edge of waterfalls and rapids (Mitchell, 1995). For any given target species, an obstruction may be total, i.e. permanently insurmountable for all individuals. It may be partial, i.e. passable for certain individuals. It may be temporary, i.e. passable at certain times of the year (under certain hydrological or temperature conditions). During low flow conditions weirs may be insurmountable because the depth of water on the face is too shallow to permit fish to swim. They may however become passable at a higher discharge rate, as water depth increases and the fall at the structure generally decreases. The negative impact on fish caused by temporary obstacles, which delay them during migration and which may cause them to stay in unsuitable zones in the lower part of the river, or cause injury as a result of repeated, fruitless attempts to pass, must not be underestimated. In the first stages of dam development, engineers and fisheries biologists were preoccupied with providing upstream fish passage facilities. 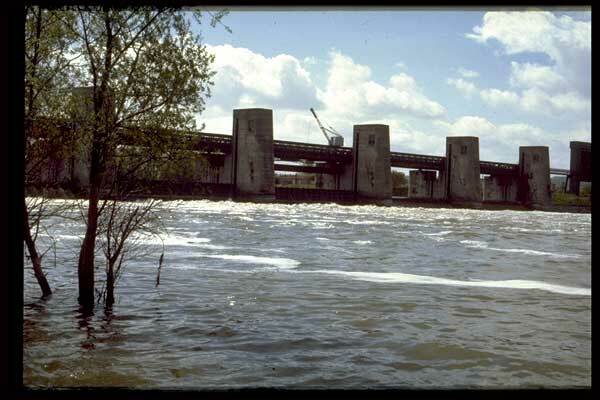 Passage through hydraulic turbines and over spillways was not considered to be a particularly important cause of damage to downstream migrating fish. Experience has shown that problems associated with downstream migration can be major factors affecting diadromous fish stocks. Downstream migration involves diadromous species: juveniles of anadromous species, adults of catadromous species and certain anadromous species (repeat spawners). For potamodromous species, downstream fish passage at hydroelectric power dams is generally considered less essential in Europe and North America. However, certain potamodromous species can migrate over very long distances, so the need for mitigation to provide passage for potamodromous fish must be considered species- and site-specific. Fish passing through hydraulic turbines are subject to various forms of stress likely to cause high mortality: probability of shocks from moving or stationary parts of the turbine (guide vanes, vanes or blades on the wheel), sudden acceleration or deceleration, very sudden variations in pressure and cavitation. Numerous experiments have been conducted in various countries (USA, Canada, Sweden, Netherlands, Germany and France), mainly on juvenile salmonids and less frequently on clupeids and eels, to determine the mortality rate due to their passage through the main types of turbine (Bell, 1981; Monten, 1985; Eicher, 1987; Larinier and Dartiguelongue, 1989; EPRI, 1992). The mortality rate for juvenile salmonids in Francis and Kaplan turbines varies greatly, depending on the properties of the wheel (diameter, speed of rotation, etc), their conditions of operation, the head, and the species and size of the fish concerned. The mortality rate varies from under 5% to over 90% in Francis turbines. On average, it is lower in Kaplan turbines, from under 5% to approximately 20%. The difference between the two types of turbine is due to the fact that Francis turbines are generally installed under higher heads. Mortality in adult eels (Anguilla spp.) is generally higher, because of their length. The mortality rate may be 4 to 5 times higher than in juvenile salmonids, reaching a minimum of 10% to 20% in large low-head turbines (as against a few per cent in juvenile salmonids), and more than 50% in the smaller turbines used in most small-scale hydroelectric power plants (Desrochers, 1994; Hadderingh and Bakker, 1998; Monten, 1985; Larinier and Dartiguelongue, 1989). The mortality rate may be higher for certain species. In physostomous species (e.g. salmonids, clupeids and cyprinids), the pressure in the swim bladder can be regulated relatively quickly through the air canal and the mouth, and these species will resist sudden variations in pressure. In physoclistic species (e.g. percids), pressure is regulated much more slowly by gaseous exchange with the blood vessels in the wall of the swim bladder. The risk of rupturing the swim bladder following a sudden drop in pressure is thus much greater and physoclistic fish are thus much more susceptible to variations in pressure (Tsvetkov et al., 1972; Larinier and Dartiguelongue, 1989). Passage through spillways may be a direct cause of injury or mortality, or an indirect cause (increased susceptibility of disorientated or shocked fish to predation). The mortality rate varies greatly from one location to another: between 0% and 4% for the Bonneville, McNary and John Day dams (about 30 m high spillways) on the Columbia River, 8% at the Glines dam (60 m high spillway) and 37% at the Lower Elwha dam (30 m high spillway) on the Elwha river for juvenile salmonids (Bell and Delacy, 1972; Ruggles and Murray, 1983). Mortalities have several causes: shearing effects, abrasion against spillway surfaces, turbulence in the stilling basin at the base of the dam, sudden variations in velocity and pressure as the fish hits the water, physical impact against energy dissipators. The manner in which energy is dissipated in the spillway can have a determinant effect on fish mortality rates. Experiments have shown that significant damage occurs (with injuries to gills, eyes and internal organs) when the impact velocity of the fish on the water surface in the downstream pool exceeds 16m/s, whatever its size (Bell & Delacy, 1972). A column of water reaches the critical velocity for fish after a drop of 13 m. Beyond this limit injuries may become significant and mortality will increase rapidly in proportion to the drop (100% mortality for a drop of 50-60 m). Passage through a spillway under free-fall conditions (i.e. free from the column of water) is always less hazardous for small fish, insofar as their terminal velocity is less than the critical velocity. For larger fish, the hazards are identical whether they pass under free-fall conditions or are contained in the column of water. 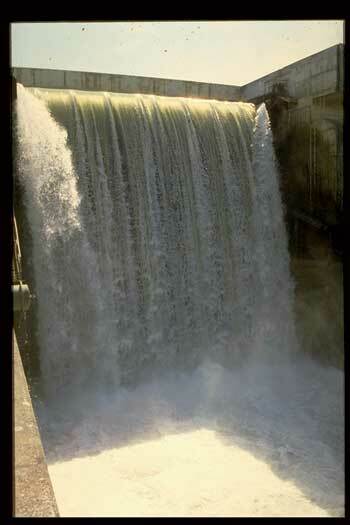 Photo 6: Spillway on the Garonne river (France). "Ski jump" spillways are preferable to other types of spillway, because the abrasion on the spillway face is eliminated, and, especially for small fish if the fish fall freely outside the column of water and on the condition that there is a pool of a sufficient volume at its base. 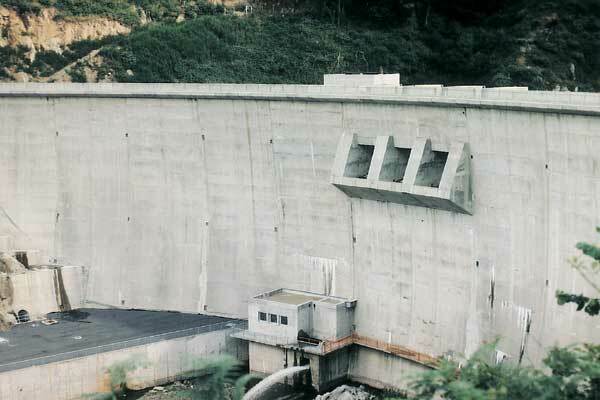 For dams of moderate heights (less than 10 metres), spillways are most often considered to be the safest way for downstream migrating fish to pass a dam, on condition there is sufficient depth at the base of the dam and no over-aggressive baffles (pre-cast blocks, riprap, etc.). Impoundments can have an effect on the timing of fish downstream migration. In the Columbia basin, during low flows, juvenile Chinook salmon reach the estuary about 40 days later than they did before the dams were constructed: impoundments of river flows by dams have more than doubled the time required for migration of juveniles to the sea. Such delays can have a rather drastic effect by exposing fish to intensive predation, to nitrogen supersaturation and several other hazards such as exposure to disease organisms and parasites. The delay can also result in a significant portion of the juvenile population residualizing and spending several months in fresh water (Ebel, 1977). Dam construction can dramatically affect migratory fish habitat. The consequence of river impoundment is the transformation of lotic environment to lentic habitats. Independently of free passage problems, species which spawn in relatively fast flowing reaches can be eliminated. From a study of the threatened fish of Oklahoma, Hubbs and Pigg (1976) suggested that 55% of the man-induced species depletions had been caused by the loss of free-flowing river habitat resulting from flooding by reservoirs, and a further 19% of the depletion was caused by the construction of dams, acting as barriers to fish migration. About 40% of the spawning grounds in the Qiantang river above the Fuchunjiang dam were lost by flooding (Zhong and Power, 1996). On the Indus river, the construction of the Gulam Mahommed Dam has deprived the migratory Hillsa ilisha of 60% of their previous spawning areas (Welcomme, 1985). On the Columbia river and its main tributary the Snake river, most spawning habitat were flooded, due to the construction of dams creating an uninterrupted series of impoundments (Raymond, 1979). The suppression of flood regime downstream from an impoundment by means of flow regulation, can deprive many fish species of spawning grounds and valuable food supply (Petts, 1988). This can lead to changes in species composition with loss of obligate floodplain spawners. Dam construction for industrial uses within the Rio Mogi Guassu Brazil has resulted in the progressive loss of flood plain wetlands (Godoy, 1975). The cumulative effect of diminished peak discharges, stabilized water levels, reduced current velocities and water temperature eliminated spawning grounds below the dams on the Qiantang and Han rivers : six migratory fish and five species favouring torrential habitats declined severely (Zhong and Power, 1996). The reaction of the fish communities of the Chari, Niger and Senegal rivers to flood failures provoked by natural climatic variations illustrates the highly detrimental effect of suppressing the flood (Welcomme, 1985). The modification of downstream river flow characteristics (regime) by an impoundment can have a variety of negative effects upon fish species: loss of stimuli for migration, loss of migration routes and spawning grounds, decreased survival of eggs and juveniles, diminished food production. Regulation of stream flow during the migratory period can alter the seasonal and daily dynamics of migration. Regulation of a river can lead to a sharp decrease in a migratory population, or even to its complete elimination. Any reduction in river discharge during the period of migratory activity can diminish the attractive potential of the river, hence the numbers of spawners entering the river is reduced. Because of this, regulation of a river can greatly influence the degree of migration to the non-regulated part of the river below the dam site. During the initial flooding of the Tsimlyanskoye reservoir, two species Acipender güldenstädti (Russian sturgeon) and Huso huso, which hitherto spawned in the Don above the confluence of the Severtskiy Donets, entered the tributary where they had not previously been known to breed (Pavlov, 1989). Zhong and Power (1996) noted that high discharge is important for inducing anadromous species to ascend rivers to spawn : after the construction of the Fuchunjiang dam on the Qiantang river, there was a significant correlation between the capture of an anadromous fish Coilia ectenes ascending the river to spawn and the amount of the discharge from the project. Variable flow regime resulting from operation of hydroelectric power-dams can have significant consequences for fish fauna : daily 2 m to 3 m fluctuation of Colorado river-levels below the Glen Canyon dam may have contributed to the decline in endemic fish (Petts, 1988). The native species have been replaced by the introduced species and spawning of the native species is restricted to tributaries. Walker et al. (1979) related the disappearance of Tandanus tandanus in the Murray river, Australia to short-term fluctuations in water level caused by reservoir releases in response to downstream water-user requirements. The fluctuations of water-level and velocities due to power demand could have disastrous effects on fish: spawning behaviour could be inhibited, juveniles could be swept downstream by high flows, sudden reductions in flow could leave eggs or juveniles stranded (Petts, 1988). Dams can modify thermal and chemical characteristics of river water : the quality of dam-releases is determined by the limnology of the impoundment, with surface-release reservoirs acting as nutrient traps and heat exporters and deep-release reservoirs exporting nutrient and cold-waters (Petts, 1988). This can affect fish species and populations downstream. Water temperature changes have often been identified as a cause of reduction in native species, particularly as a result of spawning success (Petts, 1988). Cold-water release from high dams of the Colorado river has resulted in a decline in native fish abundance. (Holden and Stalnaker, 1975). The fact that Salmo spp. had replaced some twenty native species has been attributed to the change from warm-water to cold-water. Water-chemistry changes can also be significant for fish. Release of anoxic water from the hypolimnion can cause fish mortality below dams (Bradka and Rehackova, 1964). During high water periods, water which spills over the crest of the dam can become over-saturated with atmospheric gases (oxygen and nitrogen) to a level which can be lethal for fish. Mortality can result from prolonged exposure to such lethal concentrations downstream of the spillways. Substantial mortalities of both adult and juvenile salmonids caused by high spillway flows which produced high supersaturation (120-145%) have been observed below the John Day dam on the Columbia river (Raymond, 1979). The Yacyreta dam on the Parana river generates supersaturated levels of total dissolved gases that can affect the health condition of fish: in 1994, massive fish mortality was observed in a 100 km reach below the dam (Bechara et al., 1996). Normal predation behaviour may become modified with the installation of a dam, and although few data exist to date, it appears that migrating species suffer increased predation in the vicinity of an installation, whether by other fish or birds. This may be due to the unnatural concentration of fish above the dam in the forebay, or to fish becoming trapped in turbulence or recirculating eddies below spillways, or to shocked, stressed and disoriented fish being more vulnerable to predators after turbine passage. In some rivers or hydroelectric schemes, predation may affect a substantial proportion of the fish population. On the Columbia river, predator exposure associated to turbine passage was the major causes of salmon mortality. 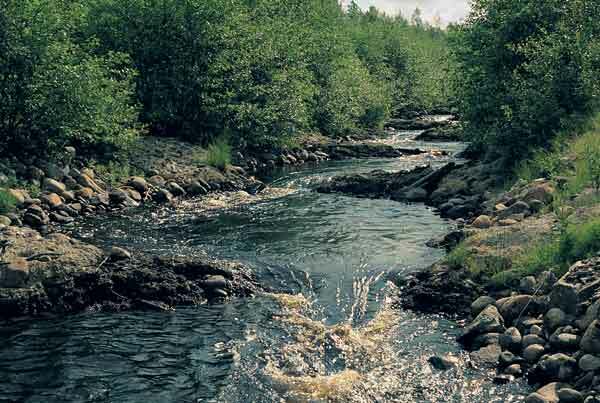 Tests at the Kaplan turbines indicated a mean loss of 7% and studies showed that the indirect mortality on juvenile coho salmon could reach 30% when indirect mortality from predation was included (Ebel et al., 1979). The general principle of upstream fish passage facilities (or fish passes) is to attract migrants to a specified point in the river downstream of the obstruction and to induce them (actively), or even make them (passively), pass upstream, by opening a waterway ( fish pass in the strict sense) or by trapping them in a tank and transferring them upstream (fish lift or transport systems such as trucking). Upstream passage technologies are considered to be well-developed for certain anadromous species including mainly salmonids (e.g. salmon, trout) and clupeids (e.g. shad, alewives, blueback herring) in North America and Europe. Upstream passage can be provided through several types of fish pass: pool-type fish passes, Denil type fish pass (or baffle-type fish passes), nature-like bypass channels, fish lifts and fish locks, collection and transportation facilities. Special designs for catadromous species have been developed in Europe, Japan, New Zealand and Australia, namely for eel. The design of a fish pass should take into account certain aspects of the behaviour of migratory species. In particular, its effectiveness is closely linked to water velocities and to flow patterns in the facility. The water velocities in the fish pass must be compatible with the swimming capacity and behaviour of the species concerned. Some species are very sensitive to certain flow regimes or conditions: water level differences between pools which are too large, excessive aeration or turbulence, existence of large eddies and flow velocities which are too low can act as a barrier for fish. In addition to hydraulic factors, fish are sensitive to other environmental parameters (level of dissolved oxygen, temperature, noise, light, odour, etc.) which can have a deterrent effect. This applies particularly if the quality of the water feeding the fish pass is different to that passing across the dam (low oxygen levels, differences in temperature and odour, etc.). Pool-type fish passes, which are widely-used, are a very old concept. An official survey carried out in France in the last century (Philippe, 1897) revealed that there were more than one hundred. The principle behind pool passes is the division of the height to be passed into several small drops forming a series of pools. The passage of water from one pool to another is either by surface overflow, through one or more submerged orifices situated in the dividing wall separating two pools, or through one or more notches or slots. Hybrid pool fish passes can often be found, for example with flow through a notch, slot or over the dividing wall combined with submerged flow through an orifice. The main parameters of a pool pass are the dimensions of the pools and the geometric characteristics of the cross-walls separating the pools (dimensions and heights of the weirs, notches, slots and orifices). These geometric characteristics together with water levels upstream and downstream of the facility determine the hydraulic behaviour of the pass i.e. the flow discharge, the difference in water level from one pool to another, and the flow pattern within the pools. The pools have a twofold objective: to offer resting areas for fish and to ensure adequate energy dissipation of water, with no carryover of energy from one pool to another. There is throughout the world a large diversity of pool-type fish passes which differ in the dimensions of the pools, the type of interconnection between pools, the differential heads between pools and the flow discharge. Pool length can vary from 0.50 m to more than 10 m, the water depth from 0.50 m to more than 2 m. The discharge can vary from a few dozen l/s to several m 3/s and the slope from more than 20% to less than 5%, most frequently ranging from 10% to 12% (Larinier, 1992a, 1998; Bates, 1992; Clay 1995). Design criteria are based on the swimming capacities and behaviour of the species involved as well as hydraulic models and field experience. The drop between pools varies from 0.10 m to more than 0.45m according to the migratory species, most frequently around 0.30. Pool volume is determined from a maximum energy dissipation in the pools which limits turbulence and aeration. This criterion seems to be commonly accepted nowadays but must be adapted for different species. The maximum values commonly used vary from 200 watts/m3 for salmonids to less than 100 watts/m3 for small species and juveniles (Larinier, 1990; 1992; Bates,1992; Beitz, pers. comm. 1999). Pool passes with deep and narrow interconnections, like vertical slot type fish passes, can accommodate significant variations in upstream and downstream water level without the need for regulation sections. Experience shows that when pool-type fish passes are well designed with respect to the different hydraulic criteria they can allow passage for most species (Travade et al., 1998). The first baffle fish passes were developed in Belgium by a civil engineer, Mr. Denil, for Atlantic salmon. The principle is to place baffles on the floor and/or walls of a rectangular flume with a relatively steep slope (10 to 25 percent), in order to reduce the mean velocities of the flow. These baffles, in shapes of varying complexity, cause secondary helical currents which ensure an extremely efficient dissipation of energy in the flow by intense transfer of the momentum. The Denil concept originated in the 1910s and was later tested with the aim of simplifying the shape of the original baffles, whilst providing a sufficient hydraulic efficiency in the USA in the 1940s, and more recently in the 1980s in France, Canada and Denmark (Larinier, 1992b; Lonnebjerg, 1980; Rajaratnam and Katopodis, 1984). There is no resting zone for fish in a Denil fish pass, and they must pass through without stopping. When the total drop and consequently the length of the pass become too great, the fish must make an excessive effort for a period which may exceed the limits of its endurance. One or several resting pools should therefore be provided. Practically, resting pools are recommended at 10-12 m intervals for adult salmon and at 6 to 8 m for smaller fish like brown trout or other adult potamodromous species (Larinier, 1992b). 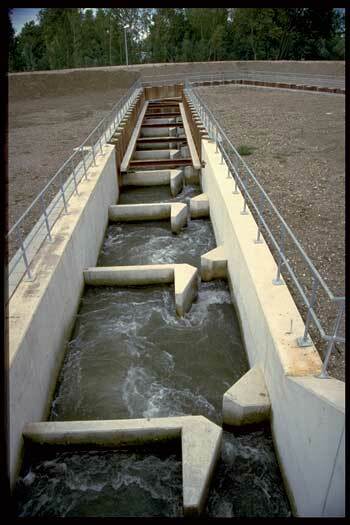 The flow in Denil fish passes is characterised by significant velocity, turbulence and aeration. This type of pass is relatively selective and is really only suitable for species such as salmon, sea-run trout, marine lamprey and large rheophilic potamodromous species such as barbel. Generally, Denil fish passes are used for fish larger than around 30 cm. They may be used for smaller species such as brown trout, on condition that the size of the baffles or slope are reduced significantly. Three designs of Denil fish passes are now in common use. The first is the "plane baffle" or "standard" Denil fish pass. The width of the baffles usually varies from 0.60 m for brown trout to up to 1.20 m for salmon and sea-run trout. These fish passes are generally operated with slopes of between 15 and 20 percent (Larinier, 1992b). In the second design used (superactive-type baffles), herringbone patterned baffles are placed only on the bottom, while the two sides of the channel are kept smooth. The width of such a design is not limited: several unit-patterns can be juxtaposed according to the size of the river and the discharge required. The baffles are made of thin, prefabricated steel. The maximum slope used is 16 percent. It is mainly used in France and more recently in Great Britain and Japan (Larinier, 1990; Armstrong, 1996; Nakamura, pers. comm., 1999). The third design (Alaska steeppass) is a prefabricated, modular style, Denil fish pass originally developed for use in remote areas. This fish pass has a more complex configuration than the two previous models. The baffles are hydraulically more effective which means that steeper 25-35% slopes can be used (OTA, 1985). The nature-like bypass channel is a waterway designed for fish passage around a particular obstruction which is very similar to a natural tributary of the river. As noted by Parasiewitz et al. (1998), the function of a nature-like bypass channel is, to some degree, restorative in that it replaces a portion of the flowing water habitat which has been lost due to impoundment. These channels are characterised by a very low gradient, generally 1 to 5 percent, even less in lowland rivers. Rather than in distinct and systematically distributed drops as in pool type passes, the energy is dissipated through a series of riffles or cascades positioned more or less regularly as in natural water courses (Gebler, 1998). The main disadvantage of this solution is that it needs considerable space in the vicinity of the obstacle and cannot be adapted to significant variation in upstream level without special devices (gates, sluices). These control devices may cause hydraulic conditions which make fish passage difficult. As with any other fish pass, it is recommended that the fish entrance to the artificial river be located as close to the obstruction as possible. Given the very low gradient, it is sometimes difficult to position the entrance immediately below the obstruction, which means it must be further downstream. This may restrict their efficiency, and consequently make them less useful for large rivers. 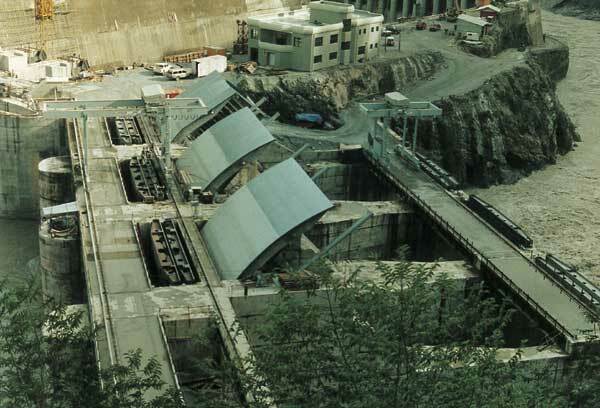 A fish lock consists of a large holding chamber located at downstream level of the dam linked to an upstream chamber at the fore bay level by a sloping or vertical shaft. 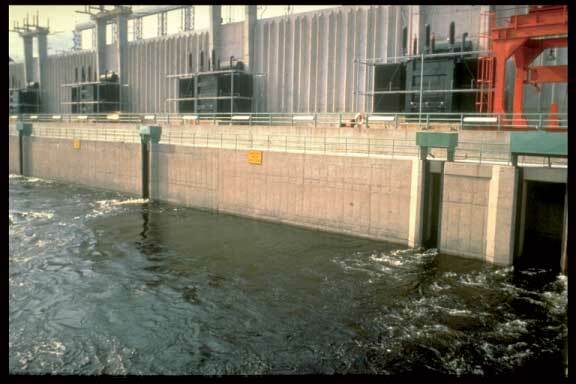 Automated control gates are fitted at the extremities of the upstream and downstream chambers (Travade and Larinier, 1992; Clay, 1995). The operating principle of a fish lock is very similar to a navigation lock. Fish are attracted into the downstream holding pool which is closed and filled along with the sloping shaft. Fish exit the upstream chamber through the opened gate. A downstream flow is established within the shaft through a bypass located in the downstream chamber to encourage the fish to leave the lock. The efficiency of such a fish facility depends mainly on the behaviour of the fish which must remain in the downstream pool during the whole of the attraction phase, follow the rising water level during the filling stage, and leave the lock before it empties. In this respect, it is necessary that the velocity and turbulence in the downstream holding pool be acceptable for the fish. On the other hand, the lock should not be filled up too quickly during the lifting phase, since thus would cause excess turbulence and aeration, which might encourage the fish to remain in the lower chamber. The fish should have sufficient time to leave the lock in order to prevent any chance of being swept back downstream when the lock empties. It is obviously impossible a priori to determine the optimum hydraulic conditions for migrating fish. The optimum characteristics of the operating cycle are closely linked to the species concerned. This is why the lock must be designed to have maximum flexibility in its operation (in the duration of each phase of the cycle, the time and extent of opening of the upstream and downstream sluices, etc.). In spite of these precautions, numerous locks have proved to be either not very efficient, or else totally inefficient. 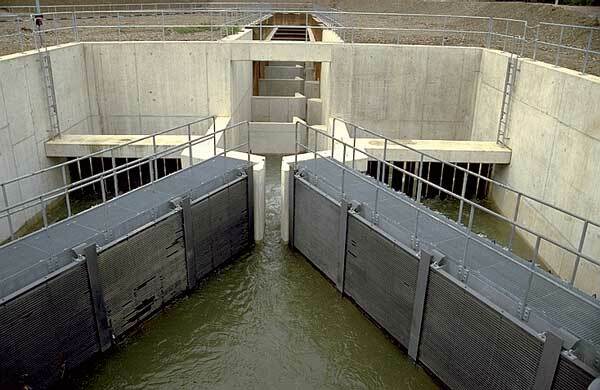 The main drawback of the lock is that it has a limited capacity (in terms of the number of fish which it can handle) compared to that of a traditional fish pass; this is due to the discontinuous nature of its operation and the restricted volume of the lower chamber. The fish attracted into the lock may also leave the downstream chamber before the end of the trapping stage. 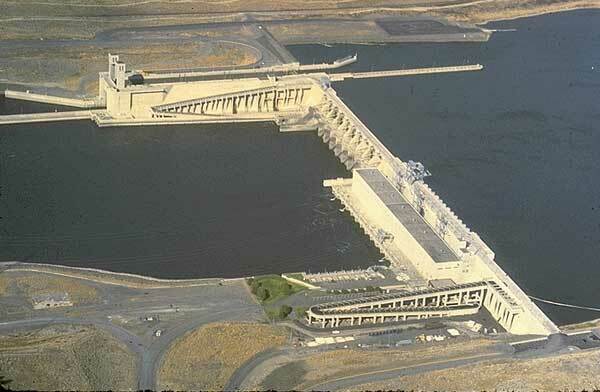 The locks constructed at the first dams on the Columbia River (Bonneville, The Dalles, McNary) and elsewhere in the USA were abandoned in favour of pool-type fish passes. Similarly, most locks in France are considered to be ineffective (some of them for obvious design reasons), and certain have been replaced by pool fish passes. Difficulties due to fish behaviour have been solved in the USA (Rizzo, 1969), in Russia (Pavlov, 1989) and more recently in Australia (Beitz, 1997) by installing a crowder in the holding pool and a follower to coax fish towards the surface of the lock during the filling phase, thus forcing fish to pass upstream. In fish lifts, fish are directly trapped in a trap with a V-shaped entrance. When the trap is raised, fish and a relatively small quantity of water in the lower part of the trap are lifted up until it reaches the top of the dam. At this point, the lower part of the trap tips forward and empties its contents into the forebay. In order to limit the height of the trap in the case of significant downstream water level variation, and to ensure easier maintenance, the fish lift can be installed upstream from a short section of conventional fish passes. Where the number of fish to be passed is much larger and can reach hundreds of thousands of individuals, it is no longer possible to hold the fish in the confined volume of the trap. High mortality may occur, especially for Allis shad. Therefore, the design is improved by incorporating a large holding pool into which migratory fish are attracted. 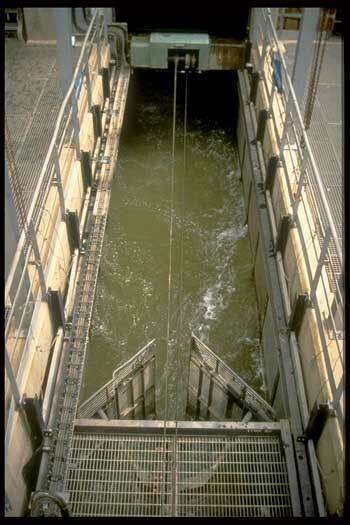 A mechanical crowder is used to force fish to enter the area above the tank at the upstream part of the holding pool. The attraction water for the fish lift enters partly at the upstream end of the tank, partly through side or floor diffusers and gratings. Crowder gates at the entrance remain in a V-trap position to prevent fish moving back out through the entrance. Fish collected in the tank are released into an exit channel with low downstream velocities (Travade and Larinier, 1992). The main advantages of fish lifts compared to other types of fish passage facilities lie in their cost, which is practically independent of the height of the dam, in their small overall volume, and in their low sensitivity to variations in the upstream water level. They are also considered to be more efficient for some species, such as shad, which have difficulty in using traditional fish passes. The main disadvantages lie in the higher cost of operation, and maintenance. Furthermore, the efficiency of lifts for small species (e.g. eel) is generally low due to the fact that sufficiently fine screens cannot be used, for operational reasons. The passage of migratory fish through navigation locks is generally fortuitous, given the low attraction of these facilities, which are located in relatively calm zones to enable boats to manoeuvre. 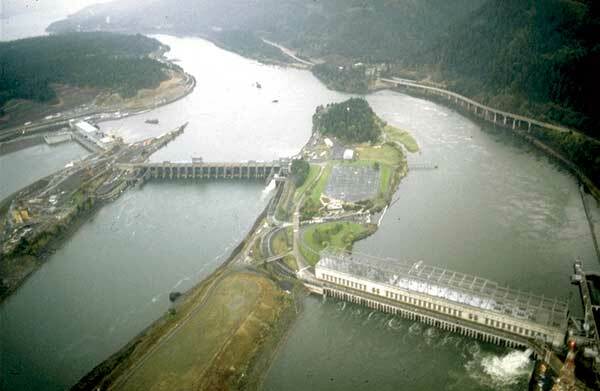 Tests carried out in the USA have shown that less than 1.5% of migrating fish use the lock at the Bonneville dam on the Columbia River (Monan et al., 1970). However, experiments have shown that navigation locks may constitute a significant back-up facility, or even a useful alternative to the construction of a fish pass at existing sites, providing that their operation is adapted to fish passage. The first condition which must be fulfilled is that a sufficient attraction flow is created in the downstream approach channel to the lock. This can be done by opening the filling sluice of the lock with the downstream gates open. Once the lock is full, it seems necessary to maintain sufficient surface velocity to encourage fish to proceed upstream. 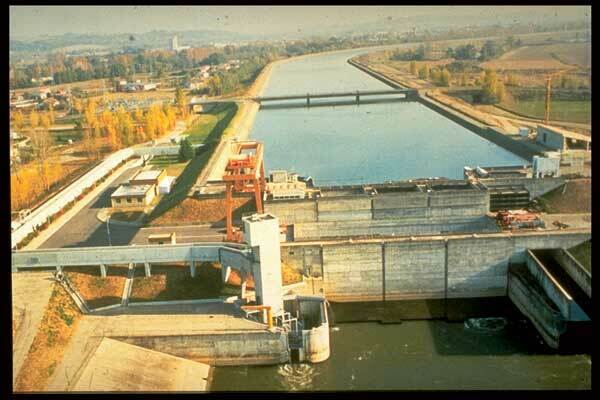 More than 10 000 shad passed through the Beaucaire navigation lock on the Rhône river in 1992 in 49 lock operation cycles (Travade and Larinier, 1992). However, the use of navigation locks as fish passage facilities is limited, because the required method of lock operation can be incompatible with navigation requirements. The technique of trapping and transporting migrants is often used as a transitory measure before upstream fish facilities are constructed. For example in the case of a series of dams when the building of fish passes occurs in stages, trapping and transportation can be an interim measure. Fish can be released upstream on the river in the spawning ground areas or transported to a hatchery, which is often the case for salmonids during the first stage of restoration programmes. Trapping and transportation can be a more long-term measure in the case of very high dams where the installation of a fish pass would be difficult, or in the case of a series of very close dams intercepting a reach without valuable habitat for breeding. In the case of dams where suitable entrance conditions are extremely expensive or even physically impossible to obtain, a second dam can be built downstream, which can be low but designed to include optimal entrance conditions. This dam leads the fish to the holding pool, where they can be trapped then transported upstream (Clay, 1995). Pavlov (1989) describes a floating fish trap used in Russia as part of a system of trapping and transporting fish over dams. It consists of a floating, non-self-propelled barge which is anchored in place. It is supplied by pumps on the end and sides to provide attraction flow. 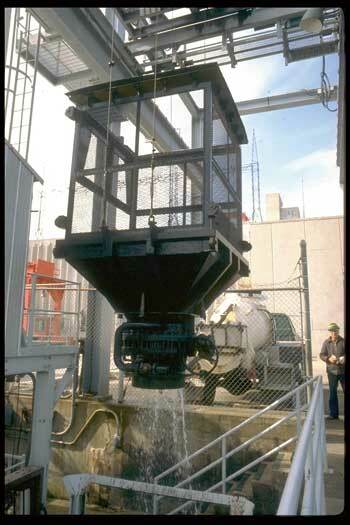 After a period of attraction, a crowder concentrates fish over a lifting device, which then lifts them to the transportation chute of a container vessel. The container vessel is self-propelled and transports fish upstream. This system has the advantage of being able to be placed anywhere in the tailrace, and in the path of migrating fish. Research efforts to adapt fish passes for catadromous species, which enter fresh water and migrate upstream as juveniles, have been much less intense and are relatively recent. 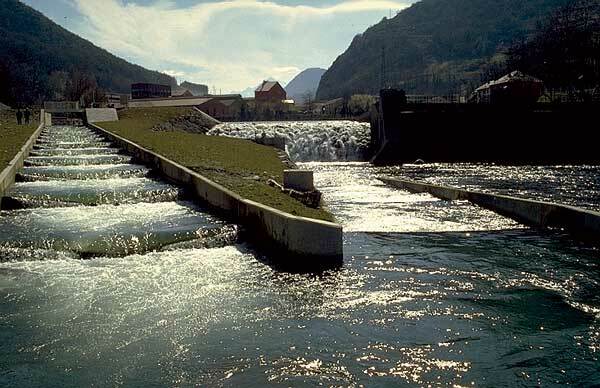 Specially designed fish passes for young eels are being developed in Europe, Canada and New Zealand (Porcher, 1992; Clay, 1995; Mitchell, 1995). Research programmes have been recently launched in Australia, Japan and France to design and test fish passes suitable for very small fish. For a fish pass to be considered efficient, the entrance must be designed so that fish find it with a minimum of delay as "No fish in = No fish out" (Bates, 1992). The width of the entrance is small in proportion to the overall width of the obstacle and its flow represents only a limited fraction of the total river flow. The only active stimulus used to guide the fish towards the entrance is the flow pattern at the obstruction. The attraction of a fish pass, i.e. the fact that fish find the entrance more or less rapidly depends on its location in relation to the obstruction, particularly the location of its entrance and the hydraulic conditions (flow discharges, velocities and flow patterns) in the vicinity of these entrances. The latter must neither be masked by the turbulence due to the turbines or the spillway, nor by recirculating zones or static water. In a case of a wide river it may be necessary to provide not only several entrances but also more than one fish pass because a single fish pass cannot be expected to attract certain species from the opposite bank. 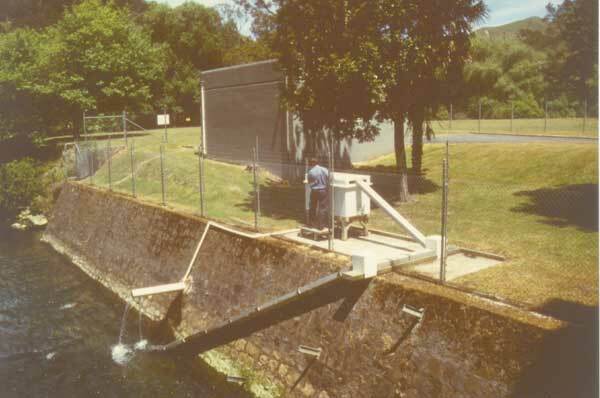 Migrating fish may arrive either at the bank where the powerhouse is located or at the opposite bank where the spillway is discharging and it is therefore advisable to design two separate fish passes, each with one or more entrances. The siting of the pass entrance at an obstruction is not the only factor to be taken into account when positioning a fish pass. The exit of the fish pass should neither be situated in a fast flowing zone near a spillway, weir or sluice, where there is a risk of the fish being swept back downstream, nor in a static area, or recirculating zone in which the fish could become trapped. Finding the best position for entrances to the fish pass where there are turbines is not easy and rarely obvious. The hydraulic barrier to the fish may be at the exit of the draft tubes, upstream of a zone of boiling water caused by the large turbulent eddies resulting from turbine discharges. On the other hand when the residual energy from the water leaving the turbine is significantly great, the hydraulic barrier to the fish may occur further downstream. Finally the location of the hydraulic barrier can vary within the same site, depending upon exactly which turbines are in use at any one time. When, in a particular site, the blockage zones cannot be clearly identified and are likely to vary depending on plant operating conditions, meaning that the correct fish pass entrance locations are not obvious, then effectiveness will be considerably improved by installing several entrances at points which appear, a priori, to be the most favourable. The problem is extremely complicated and difficult to solve in the case where the fish passage facility is intended for several species whose swimming abilities and migratory behaviour are very different, or sometimes even unknown. If the pass is intended primarily for migratory salmonids then the entrance should be as far upstream as possible and relatively close to the turbines. On the other hand, this may not be favourable for smaller fish which do not have the same swimming ability. For these species it is better to position the entrance to the fish pass further downstream, in a calmer and less turbulent zone. This gives rise to the necessity to define the target species clearly at the outset of the project. The discharge through the fish passage facility must be sufficient to compete with the flow in the river during the migration period. It is difficult to give precise criteria, but generally the flow passing through the fish pass must be of the order of 1-5% of the competing flow. It is clear that the higher the percentage flow of the water course passing through the fish pass, the greater the attraction of the pass will be. Although it is reasonably possible to direct a large fraction of the flow of the river through the fish pass in the case of small rivers, this is not the case in large rivers where the mean flow can exceed several hundred m 3/s. It then becomes difficult, in terms of cost, to maintain a sufficient flow through the facility, particularly during high water periods. On major rivers an attraction flow of around 10% of the minimum flow of the river (for the lower design flow), and between 1 and 1.5% of the higher design flow seem to be satisfactory for a well located fish pass to work. Generally, although it may be demonstrated that an increase in attraction flow generally results in improved efficiency, it is very difficult to quantify the benefit at each site, either in terms of an increased percentage of migrants passing, or a reduction in the migration delay. It is evident that part of the improvement in efficiency is a function of the higher number of entrances usually made possible by the increased availability of flow for the fish pass in these circumstances. When a large flow of water is needed to attract fish into a fish pass (several m3/s) only a fraction should be allowed through the fish pass itself in order to limit the size and the cost of the facilities. The auxiliary flow needed for attraction is then injected at low pressure and velocity through screens in the downstream section of the pass, or at the entrance itself. The auxiliary flow (or supplementary attraction flow) is fed either by gravity after dissipation of the energy in a pool, or, in large installations either by pumping from the downstream pool or taking discharge after passage through one or several small special turbines in order to reduce energy losses (Bates, 1992; Larinier, 1992). The answer to the question "are fish passes effective mitigation means" is not obvious. The biological objectives of building a fish pass vary according to site, and even on the same site depending on the species considered. The concept of effectiveness is therefore very variable and can only be defined with respect to an objective. The concepts of effectiveness and efficiency may be used to clarify the degree of mitigation provided by a fish pass. Effectiveness is a qualitative concept which consists in checking that the pass is capable of letting all target species through within the range of environmental conditions observed during the migration period. Effectiveness may be measured through inspections and checks: visual inspection, trapping, video checks (Travade et al., 1998). In a pass designed for diadromous species such as salmon and located downstream of all the spawning grounds, the objective is to move the whole migrating population through. If this river is marked by numerous obstacles, the aim is to minimize the time taken by the fish to enter the pass, so that the migrating fish reach the reproduction areas on time. The efficiency of a fish pass is expressed both in terms of the percentage of the population which clear the obstacle and the migration delay, i.e. how long the population, or part of the population, takes to clear the obstacle. On the other hand, if the pass is located upstream of the river in the spawning grounds, the requirements on percentage and time taken may be less stringent seeing that the fish may reproduce downstream and that the motivation to migrate may be variable. Whatever the case, the fish pass must be sufficiently efficient so as not to constitute a limiting factor in the long-term maintenance of migrating stock. When dealing with a fish pass for potamodromous species, whose biological objective is above all to avoid the sectorisation of populations in the various reaches, it is not necessary to seek to move all the populations downstream of an obstacle. The pass will be effective if a "certain number" of individuals, i.e. a significant proportion with respect to the population downstream of the obstacle, gets through the pass. The objective of a fish pass may be more ambitious and may consist in providing a passage for all species at every stage in the river and for all individuals wishing to clear the obstacle. If no goal is set, there can be no real measure of effectiveness. 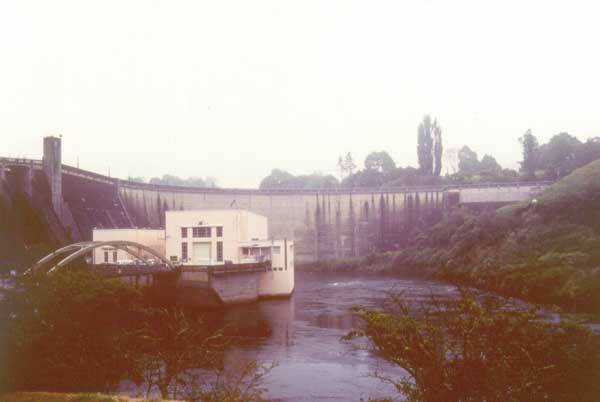 Lack of attraction of the facility, resulting from a poor position of the fish pass or insufficient flow at the entrance of the facility in relation to the flow discharge into the river. Poor design of the facility with regard to the variations in water levels upstream and downstream during the migration period, resulting in under or oversupply of flow to the fish pass, or excessive drop at the entrance. This may be due to poor appreciation of the range of the upstream and/or downstream water levels during the project planning phase, or a subsequent change in these levels. Poor dimensions : pools with insufficient volume causing excessive turbulence and aeration, excessive drop between pools, insufficient depth for the fish, or the flow pattern in the pools not suitable for the target species. Frequent clogging up or obstruction of the fish passage facility, resulting from inadequate protection against debris, or too exposed a position, or quite simply inadequate maintenance on the part of the operator. Malfunctioning of parts which regulate the flow discharge and the drops between pools (automatic sluice gates, etc. ), or which ensure the functioning of the facility in the case of fish lifts and fish locks (automatic sluice gates, hoist for the tank, moving screens, etc.). However, there are limits to the effectiveness of a fish pass. Even when 100 % effective, a pass may prove insufficient for maintaining the balance of a migratory population in the long term. As previously pointed out, in addition to problems arising from fish passage there are indirect effects such as a change in hydrological regime, water quality, an increase in predation and the loss or deterioration of the habitat upstream or downstream which may also be limiting factors. These aspects are however species- and site-specific. Other mitigation measures, for example on specific water flow management for fish at certain times of the year, may prove indispensable.